Review: The Mortal Instruments: The Graphic Novel Vol. 1 • Tips, Trends & News in 60 Seconds or Less! Based on The Mortal Instruments novel series, The Mortal Instruments: The Graphic Novel Vol. 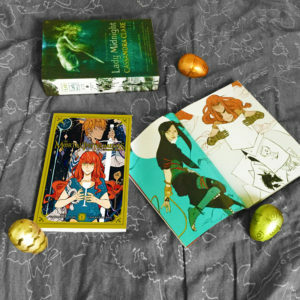 1 is the graphic novelization written by Cassandra Clare and illustrated by Cassandra Jean. The first volume follows Clary as she discovers the Shadowhunter world shortly after her mother disappears, but is not the full adaptation of City of Bones. I love seeing novels being brought to life in new adaptations, and despite not being a fan of the novel version (and the movie even less), I enjoyed the first installment of the graphic novelization! Cassandra Jean captures all of the important details, scenes and plot points from the novel — at no point did the story itself feel rushed or as if it was missing elements. Although I would have loved to see the full adaptation of City of Bones in this volume, I personally don’t mind the story continuing in longer installments. Even if I had never read the novel itself, The Mortal Instruments: The Graphic Novel Vol. 1 is a solid read and is perfect for those new and old to the series.